Download it in high quality for free at the end of this publication. Ready to print. PEppa Pig likes everyone, both boys and girls. If you are preparing your son's or daughter's birthday party start by downloading the free Peppa Pig birthday invitation, that the first thing is to let all the friends and family know. If you prefer a Peppa Pig Birthday Invitation personalized with a photo of the birthday boy instead of having to hand write the data with a pen, we can arrange to personalize it with the name, photo and an amazing design. Get them from only 7,95 € in www.Piruchita.com in digital format so you can print as many as you want or send them via WhatsApp. Our beloved Peppa Pig is also known in Latin America as "The Peppa pig"Where he also has a large following. The series goes from the experiences of a family of pigs in a world full of animals, where everyone coexists in peace, harmony and happiness. Peppa will go to school, for a walk, she will have many adventures with her friends and family, she will help at home, etc. In this way, he teaches good ethical values ​​to the little ones in the house in a fun and entertaining way. Peppa, although she is the protagonist, is not where all the chapters are centered. In many cases the chapters deal with their relatives and how they behave in different situations. A very funny and educational point of the cartoon series Peppa Pig, is that during all conversations breathe as do the little pigs with their "orrhhggfm orrhhggf" (which is better known as "oink, oink", but more real). Furthermore, it is not only the little pigs that emit these sounds, the different animals that appear in the series, each one emits its characteristic sound during conversations. The Peppa Pig family is composed of Papa Pig, Mama Pig, his brother George, Grandpa Pig, Grandma Pig and his pet the parrot Polly. I take this opportunity to give you a quick trick, in the rtve Clan page Many episodes of Peppa Pig are available in both Spanish and English, games, activities to paint and color, puzzles, drawings to cut, etc. 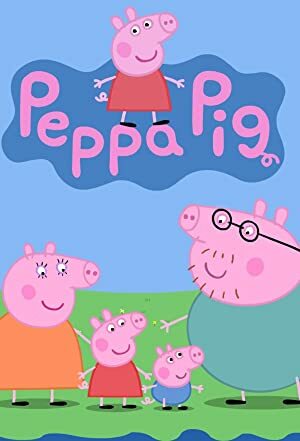 The protagonist of this series is Peppa, a little pig of anthropomorphic features who lives with her little brother George and her parents: Mama (Mummy) Pig and Papa (Daddy) Pig. Its main setting is its home, that's where the plot of the episodes take place. In some episodes, his family is shown leaving the house, walking with his car, at his friends' house or already being in another place. The most beloved piglet of children's television is here to stay, because since its launch in Hispano-America in the 2006, it has captured the attention of the youngest of the house. 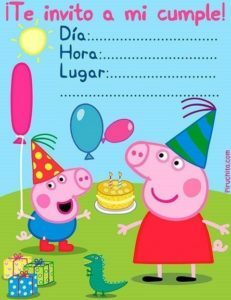 The bet of the Discovery Kids channel in 2013, catapulted it to be one of the most watched series for children in Latin America, positioning it as one of the most watched cartoons and that is why we want you to have Peppa Pig's birthday invitation. Peppa with her particular way of laughing, together with her younger brother George and their parents: Mama Cerdita and Papá Cerdito, manage to make the children smile by showing their daily activities, especially on the main stages such as their own home and school. the one that assists with the rest of his friends. The loveliest pig on TV loves to jump in the puddles of mud and go out to play with her friends, the other characters in the series such as Rebbeca and Richard Liebre, Susy Oveja and Pedro Poni, among many children who attend school with her . 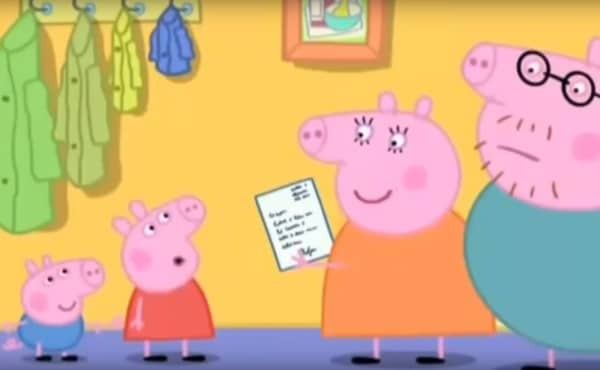 As Peppa, you can also play with all your friends on the day of your party and we offer you the free invitation card of the pig that most adore the little ones of the house, so you can send it digitally via Whatsapp, email or so that you publish it through the social network that you like the most. And to encourage you more, keep reading that we tell you how this character with animal features, but who does all human activities, managed to break through all the barriers to reach many homes in the world. The first episode of Peppa Pig was broadcast in the 2004 year by a British channel, because the country of origin of this television series, and therefore of this very peculiar character, is the United Kingdom. From there, the idea of ​​this cartoon that today has its own theme park, located in New Forest, Hampshire and opened its doors in the year 2011. El Peppa Pig World has the usual attractions like roller coasters, but also recreates scenarios of the series such as buildings, the house on the hill where Peppa and his family live. Of course, they could not miss puddles of mud where children can do the favorite activity of this character. The geniuses behind this successful children's play are the British Neville Ashley, Mark Baker and Phil Daves, who decided to promote important values ​​for young children such as trust, friendship, caring for nature and many more through this cartoon. Peppa Pig is currently broadcast in 180 countries of the world and part of its success is due to the fact that it captures the attention of children thanks to the short duration of each of its chapters. An evidence of his triumph is that several seasons have also been issued plus some special episodes. The proposal of its creators to conquer the Anglo-Saxon and Spanish-speaking public was to recreate common situations for children in interaction with the world around them, such as going to bed, going to school, going out for a walk, playing with friends and even brush your teeth. They also focused on using a simple dialogue that is easy for children to understand and that is not absurd or too simple for parents and adults. On the other hand, the characters are not idealized by placing them as perfect beings. On the contrary, although they highlight the virtues that they possess, they also highlight the defects that characterize them, such as, for example, Papa Pig's dismissal or how impatient George can become in a certain situation or why not? the bad character of Peppa herself. All this, makes them show themselves in a much more human way - in spite of being animals - and that they become closer to their spectators, because each one of Peppa's fans can identify with the situations that they live on a daily basis like walking in cars, being able to go for a walk, for an ice cream and many other things. Another point in favor is that the series is not only designed for girls, but also for children because although it revolves around a female character, which is the adorable little pig, the males of the house are able to identify with their Hemanito George, who is the youngest in the family and loves dinosaurs, chocolate cake and also hot milk. What does it show us? Learning is the main focus of this series that even shows in one of his episodes called "Friend by Correspondence" how the little piglet is able to learn a language different from yours like the French, because it sends letters with a friend called Albina Asna . Although at first the language seems funny, her parents help her to understand it and finally she manages to have a telephone conversation with her new friend, reproducing basic sentences in French. At the end of the episode, Albina Asna arrives with her family to exchange cultures and they end up jumping in the puddles of mud on the outskirts of the house on the hill. In general, children can see in Peppa episodes how to identify colors, to count objects, to pronounce words, to use language correctly and the importance of order in their spaces. As mentioned at the beginning, this little pig came to stay, crossing the barriers of the small screen, because Peppa is more than a series. In addition to having its own theme park, like other cartoons, much of its annual collection comes from the sale of all derivative products and licenses that are under the name of this character. There is a huge amount of toys in the series, starting with stuffed animals, swimming pools and even the Lego brand took out construction kits under the image of this little pig. But this does not stop there, because there are also millions of stationery, kitchen appliances, clothing and household items from Peppa Pig. And video games are not left behind either. The Ubisoft brand developed two of them for the Nintendo Wii and Nintendo DS consoles. Peppa Pig: The Game in the year 2009 and Peppa Pig: Fun and Games in the 2010 year. As you can see, Peppa is not only recognized by children at an early age, but also by different festivals and awards that classify it as better animation for children and better preschool series. In addition, she has been nominated by the British Children's Academy as the series with the best writing and best multiplatform. Even the International Animation Film Festival in Annecy gave it as winner in 2005 as the best TV production, the best animation series of children and, as if that were not enough, the best European program of the year. At the bottom of the page you will find the link that will take you directly to the Peppa Pig invitations for free and you can download it, but you will have to put the name of your guests, the date and place of your event with a ballpoint pen. Although if you want a much more impeccable finish we offer you the Premium service so you personalize your invitations, even with your own photo in them with very accessible prices that range from the 7,95 euros to the 9,95, thus saving time that you can use in highlighting other details of your party. Are you looking for Peppa Pig toys to give? Do you prefer to give clothes, accessories, or costumes Peppa Pig?